Turkey witnessed the first known Human Rights Declaration, in 1463, 485 years before the Universal Declaration of Human Rights. Attendance passes will be required for most overseas commemorations conducted by the Department of Veterans’ Affairs (DVA). The number of attendance passes available will be determined by the safe, secure and comfortable carrying capacity of the commemorative sites. To confirm whether an attendance pass is required for the service you are attending, please check the service specific page on the DVA website. The acceptance of registrations and subsequent allocation of attendance passes will primarily be facilitated through an online registration form. Obtain your attendance pass for available overseas commemorations. 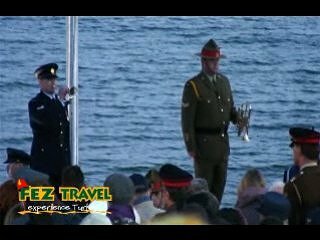 Fez Travel's 2020 ANZAC Day tours will let you experience the amazing anniversary of the original landing in 1915 at the ANZAC Day Dawn Service held in ANZAC Cove, Gallipoli, as well as the Australian service at Lone Pine Memorial or the New Zealand service at Chunuk Bair Memorial. We operate tours to the Gallipoli battlefields every day of the year. 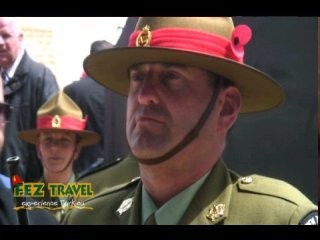 Since 1997, we have been one of the biggest tour operators for ANZAC Day tours. Our Head Tour Guides for Gallipoli are the best in Turkey. They brief and train the many licensed guides that we need to employ for our ANZAC Day tours so you can be sure of a brilliant 2020 ANZAC Day experience. As soon as we are able to we will cross the Dardanelles to the Gallipoli Peninsula, and head straight to the Anzac area to secure the best spot possible. If you want the cheapest ANZAC Day tour then you've picked the wrong place but just consider one thing - are you really going to risk your once in a lifetime 2020 ANZAC Day experience for less than the cost of a good night out? We wont give you something for nothing, but we guarantee to deliver what you've paid for. Turkey does a fantastic job every day of the year in accommodating Australian's and New Zealander's who want to visit Gallipoli, ANZAC Cove, Lone Pine, Chunuk Bair etc., especially on ANZAC Day. When you travel with Fez you can be sure you are putting something back into the local Turkish economy as Fez are 100% Turkish owned - our head office is in Istanbul. Want to enhance your ANZAC Day experience? There are probably 3 or 4 great Gallipoli tour guides in the whole of Turkey so if a company tells you that their tour guides are Gallipoli experts, well, you decide the truth? We suggest you read a little about Gallipoli before your trip, this will ensure you'll have a far greater appreciation of the commemorations. Please also remember that ANZAC Day is a huge event so be prepared that things may not go according to schedule. 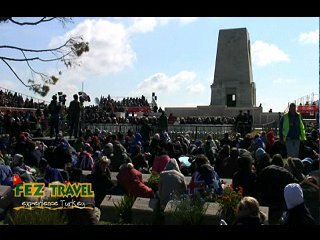 ANZAC Day snapshot, what's it like at Gallipoli on ANZAC Day? As soon as we are able to, you are taken to the site of the dawn service to get a good spot. There are food stalls selling a great variety of Turkish Kebabs, pancakes and fast hot foods close-by so you won't go hungry. There are big screens and music to entertain you and to thank you - the people who have made the pilgrimage to Gallipoli for ANZAC Day. War Veterans's, military personnel and media will be everywhere and the atmosphere is electric. There is a unique feeling in the air, a celebration of peace subdued by a cloud of commemoration. Within a few hours, the site will appear like a sea of colour with thousands of Aussies and Kiwis sprawling out on the grass, warmly wrapped up in sleeping bags, National flags flying high and rugby tops on their backs. Get a few hours of rest/sleep on the grass because soon the MC will be asking you to squash forward to try and make space for the thousands more people still to come. The buzzing atmosphere will permeate the whole night. Well before the grey light of dawn signals the start of the dawn service, speakers and entertainers begin their addresses, folk songs and stories. For information on ANZAC day is run visit our ANZAC Day Information page.